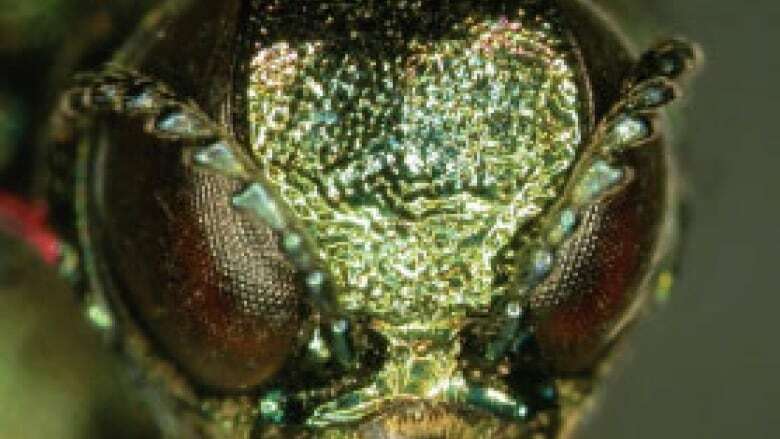 Research scientists are in Montreal this week to try to fight the emerald ash borer— this time by introducing a disease that will hopefully kill the beetles off. The City of Montreal, with help from Natural Resources Canada, is continuing its uphill battle against the emerald ash borer — this time by introducing a disease to the species that will hopefully kill the beetles off. "Right now, we have no way to control the emerald ash borer. It's living freely with no predators and no disease," said Robert Lavallée, an entomologist and research scientist with Natural Resources Canada. Lavallée is in Montreal this week collecting beetles and checking the 210 traps they have set up across five of Montreal's boroughs. Lavallée and his research team have placed fungus-laden traps high in the ash trees. The beetle is lured into the trap, gets covered in fungus, and then spreads the fungus and the disease to its partner during mating. Lavallée said the fungus traps have had success in rural areas, but they don't know yet how effective they are in an urban setting. The City of Montreal says it's difficult to estimate just how many of Montreal's 200,000 ash trees could be infected. Last year, 572 trees tested positive. City officials said they'll treat 18,000 trees this year and in the fall, 400 trees will be screened for infections. The next step for his team is to bring the beetles they collect back to the lab to see if they are in fact carrying the fungus and spreading it to the population. The fungus traps go hand-in-hand with other city initiatives to fight the emerald ash borer, including preventatively spraying healthy trees and introducing its natural predator — non-stinging parasitic Chinese wasps. Despite these efforts, Lavallée said it's going to be hard to save Montreal's ash trees. "The insect is difficult to see and to catch," said Lavallée. "We're always a few steps behind it...When you see a tree losing its leaves or losing its canopy, it's really too late." He said the work they're doing is long-term, and will provide important research for other cities in Quebec and in Canada that don't yet have the beetle.